Download Digital Vector Editable European Maps of all the countries in Europe. Powerpoint and Illustrator maps included. It has taken us many months to produce our 2 digit postcode map of all the countries of Europe. We have produced a single set of vector files covering all the countries of Europe down to the first 2 digits of their postcode or (zip code in some regions). Our illustrator artwork for this European Postcode Map Dataset is fully layered by country meaning it’s incredibly easy to show/hide layers and isolate just the countries you require. There’s also a layer for all the Capital cities across Europe and another layer for all the other major towns and cities around the EU. 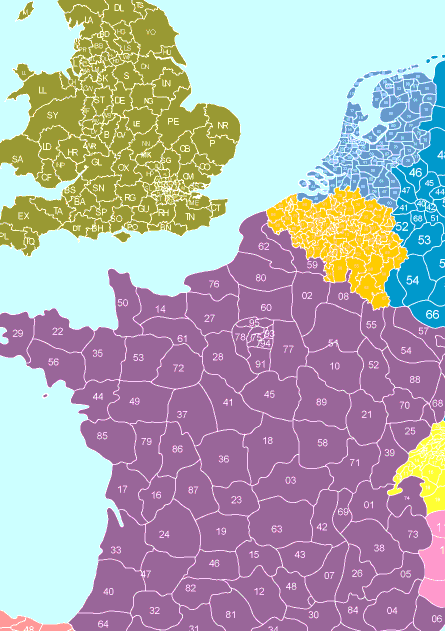 Over 2,000 individual postal code areas across Europe are included in this map. RECENTLY UPDATED (14/06/2017): We've just updated our Full European Postcode map to include over 400 Major towns and cities across Europe. All	the	city	names	are included on a seperate illustrator layer which can be switched on or off with ease. Each European city name has a dot next to it locating it more precisely on the map. LATEST UPDATE (28/09/2017): Following on from our revision to add town and city names to our European Postal Codes map we’ve made another update. We’ve included a large portion of Russia into the postal code map of Europe. We’ve also included some outlined country borders such as Iran, Iraq and Syria to make Russia and Turkey appear more connected. As well as having the whole of Europe on one map, we’ve included individual files for each country. So each country has its own set of files including pdf, ai, eps, svg etc. And to make this package even more widely available we’ve reduced the total cost from £155 down to £55. In this file bundle you get editable illustrator eu postcode files of each individual country in europe. You will also receive a single Adobe Illustrator file which contains all the individual postal code maps of european countries together in one place. A very complex file with a lot of information. Vector layered files which are fully editable with the right software. Some of the countries of europe have dubious postal code systems in place. We've spent a lot of time to make this map as accurate as possible however there maybe some small errors we don't know about. You can purchase maps of the individual countries of europe shownig postal codes areas or zones down to 2 digits. The maps can be edited using Adobe Illustrator or Powerpoint and have all been extracted from the larger EU map so could be re-arranged and placed back together if required. It's much more economical to purchase the whole EU map. You can download free pdf postcode maps of european countries which contain a small watermark if you want to use them simply for reference. If you need more than 10 countries the full EU map works out better value.